When all the people heard of Jesus' arrival, they flocked to see him and also to see Lazarus, the man Jesus had raised from the dead. 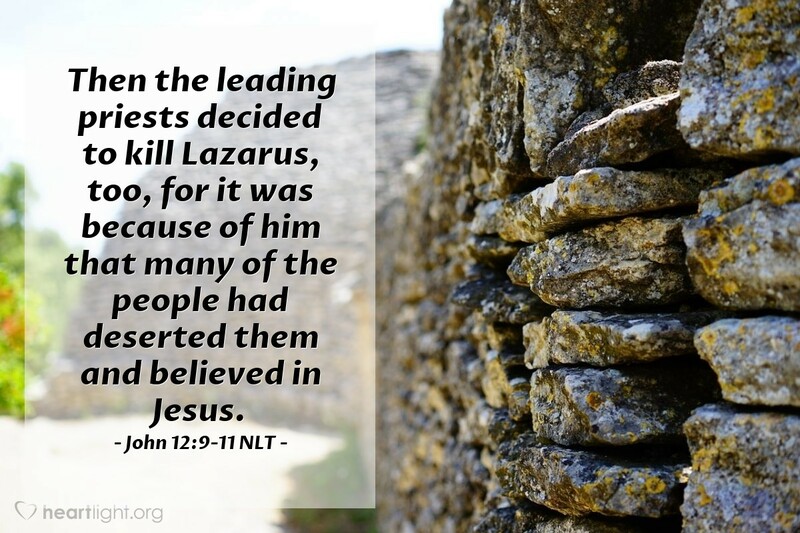 Then the leading priests decided to kill Lazarus, too, for it was because of him that many of the people had deserted them and believed in Jesus. How could a religious movement intent on doing good become murderous and treacherous? Over the centuries, there have been atrocities committed in the name of religion. There have also been atrocities committed against religious people. The hatred aimed at Jesus boils over against Lazarus. This hatred is a sad reminder of what happens when people no longer pursue the will of God and settle for the preservation of their religion. This situation is a sobering warning. When we have to find creative ways to justify how we could do something ungodly to one of God's children, we need to scrutinize our actions very carefully and change our ways. God's two great commands to us still apply: Love the Lord your God and love your neighbor as yourself. Holy and righteous God, fill me with your Spirit and your wisdom. I never want to push away someone who is searching for your will or harm anyone who is seeking you no matter how much I might not understand them or disagree with them. In Jesus' name, I ask for your wisdom. Amen.